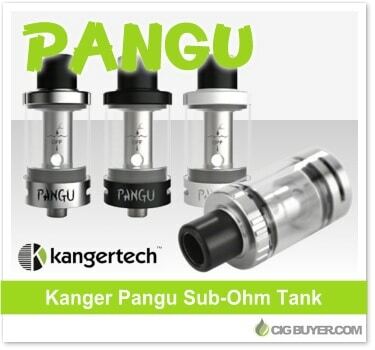 If you’re searching for an attractive, hassle-free tank that produces outstanding flavor, search no further than the Kanger Pangu Sub-Ohm Tank. It incorporates Kangertech’s new PGOCC Coils which are reminiscent of an old-style cartomizer – easy to swap out and mess free! The elongated coils are designed for DL or MTL style vaping, available in SS at 0.5 ohm and NiChrome at 1.5 ohm. The Pangu Tank is top-filled, has 3.5ml of capacity and includes adjustable juice flow and airflow control; with a leak and condensation free design.